In 1998, with the first RSV Milles flying out of showrooms, Aprilia launched a new project to create a new sports tourer with the emphasis on sport. In charge of the project was Aprilia Research and Development’s Technical Manager, Pierluigi Marconi, who had joined the company from Bimota the previous year. Marconi had risen through the ranks after joining Bimota from university, becoming Technical Manager in the early 90s and quickly gaining a reputation for innovation and excellence in design. Under Marconi’s direction Bimota produced the most technologically advanced – and sometimes the most bizarre – bikes of the 90s. See the panel on the right for a list. He also was responsible for the 500 Vdue – the mechanical woes of which eventually broke the company. For the Futura project Marconi was given a team of seven and set up at Aprilia’s scooter engine assembly plant in San Marino, rather than the headquarters in Noale. 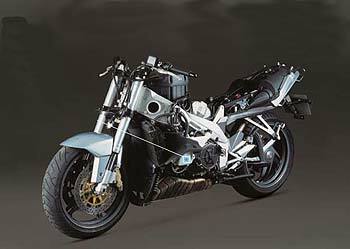 From the outset it was decided the Futura would use the Mille’s 998 dohc 60 degree Vee twin engine and a frame almost identical to that used by the sports bike. Rake and trail of 25.6 degrees, compared with the Mille’s 24.5 degrees and longer trail. The engine was based on the 2000 Mille, but Marconi and his team thought it a little too lumpy for a sports tourer so they lavished attention on turning it into a smooth powerplant ideally suited for doing big miles with a minimum of vibration. So out went the Mille’s fuel injection system, to be replaced by a Sagem system, and in came new throttle bodies with smaller pipes to increase low-rev torque, and new injectors. The generator size was increased by 30 per cent to make the motor smoother, while increasing output to 470W to cope with touring accessories. 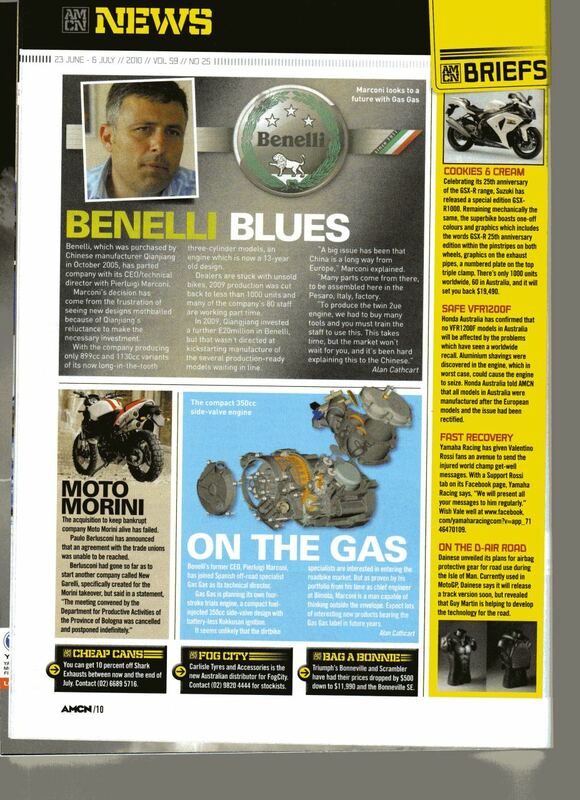 “Most mechancial parts and the valve timing are the same as the RSV’s,” Marconi told Fast Bikes magazine (UK) in 2001. But the Futura radically departed from its sports bike cousin in its single sided swing arm, which was tied in with its radical (for the time) under seat exhaust – and with the integral luggage. His team also deserves a lot of credit for designing an exhaust that didn’t heat up the rider’s (and passenger’s) wedding tackle, unlike some Ducatis and especially Triumph’s later Sprint ST. So much so that the bike met Euro 1 emissions regulations, even without the catalytic converter. Aprilia were rightly proud of their creation at the Futura’s press launch in Sicily in 2001, and told journalists that there were plans for an ABS option and a power outlet for accessories for the 2002 bikes. But they never happened. Maybe it was the poor sales or maybe the decision had already been made higher up to let the Futura die and let Moto Guzzi – acquired the year before – make the tourers. But there’s another aspect that may have proved the most important of all. Just six months after the Futura was launched to the world, Marconi left Aprilia and became Technical Manager for Benelli. With Marconi gone it appears Aprilia lost interest in the Futura, and the promised upgrades to the bike did not materialise. It certainly raises a question over whether Marconi’s departure and the slow death of the Futura were linked. Marconi stayed with Benelli, becoming CEO/Chief Engineer in 2005. He quit in summer 2010 in frustration at the company’s owners, Quianjiang, refusal to put new designs into production. He’s now working for Gas-Gas, leading the Spanish off road bike manufacturers’ project to build a side valve four stroke engine. This article from an Australian magazine provides more information. Marconi’s bikes for Bimota: YB8, YB8e, YB8 Furano, DB2, DB2sv, DB2ef, DB3 Mantra, YB9 Bellaria, YB9sri, YB10, YB10 biposto, SB6, SB6R, SB7, SB8R, Supermono, Vdue, Tesi.